Watching “How The Grinch Stole Christmas” is a yearly tradition for so many of us – it’s a Christmas classic that will never go out of style. Throwing a little Grinch viewing party will make family movie night even more fun. 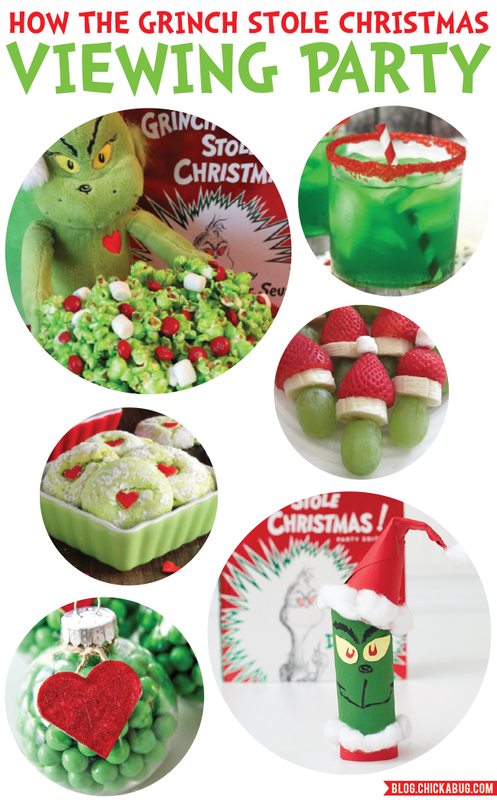 Here are some simple ideas for Grinch themed snacks, plus two easy crafts to go along with the movie! Grinch popcorn by Two Sisters Crafting – made with mini marshmallows and red M&M’s. Yum! Grinch punch by Simplistically Living – a fruity, sweet green punch. The red sugar rim is the best part! Grinch fruit kabobs by Clean and Scentsible – a healthy snack made with green grapes, banana slices, strawberries, and a mini marshmallow. Grinch cookies by In Katrina’s Kitchen – these are so sweet. They’re easy to make too – all you need is boxed vanilla cake mix and just a few mix-ins. Grinch ornaments by Jolynne Shane – make these as a craft during the party or give them as little gifts after the movie. If you don’t want to fill them with candy you could also use green foil shreds. Grinch toilet paper craft by Crafts By Courtney – paint the toilet paper rolls before watching the movie, then decorate them afterwards. You probably already have all the supplies needed to make the craft, which is a plus!